Abet level-4 or Grade 10 with 1-2 years experience in a Hospital environment will be added as an advantage. be honest, reliable and have physical Strength. Transport patients from registration points to different areas within the hospital. Transport corpse from the wards to mortuary. Offloading of patients from ambulance and private cars to the stretchers. 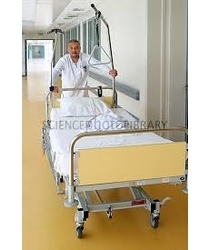 Cleaning of stretchers and wheel chairs after usage at all time . Report any duties allocated by supervisor.